Bearing adapter cable must be cataloged in strict accordance with part numbers. The maintenance of this directory storage costs a lot of money, yet is often faulty. For repository returned adapter cables are often misfiled. The next time use the search operation can be very time consuming. An adapter cable is provided under circumstances for several specimens. Whether a particular cable was removed from the stock or just misplaced, is not always traceable. Same adapter cables of different length are often stored in the same repository. If a specific length is required, it is very time-consuming to select the appropriate cable. CKT has operated on the problems associated with storage and management of adapter cables extensive studies. The findings have led to the development of intelligent adapter cable management system that solves the problems described above. In addition, by the connection to the test system and the handling of the cables have been greatly simplified, which greatly affects cost reducing. Virtually unlimited storage space positions for adapter cable. 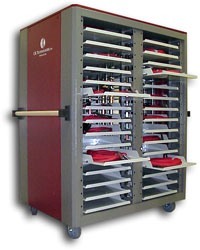 Storage bins for adapter cable can be integrated into mobile cabinets or stationary racks. Adapters can be stored at any position. There is no need for them to be stored in pre-defined locations. Misplaced adapters are a thing of the past. The user can see visually that all the necessary adapter cables were removed from the storage locations. Adapter cable for single or multiple specimens are easily recognized. Mobile cabinets are operated battery. No obstruction by power cable. An additional and obvious advantage is provided if the test system can read out the chip addresses of the adapter cable. Each adapter cable can then optionally be connected to any free test system output connector. This additional equipment feature reduces connection times and costs dramatically.